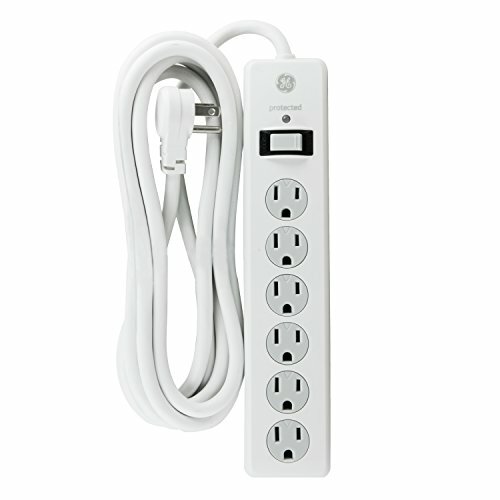 Maximize your outlets using the 6-Outlet General Purpose Surge Protector from GE. This general purpose surge protector features six standard outlets and an integrated circuit breaker for overload protection, and is equipped with a protection indicator light to let you know at a glance that your components are protected, an extra-long 10-foot power cord for added versatility, and key holes slots for convenient mounting throughout your home. The 6-Outlet General Purpose Surge Protector comes with a 800 Joules protection rating and $80,000 connected equipment warranty. Intended for indoor use only. UL Listed and backed by a limited lifetime warranty.